At school last week, I gave a farewell speech to the student body. Following my speech, one of our senior students spoke on behalf of the learners to thank me for all that I’ve done at the school. Some students gave written notes of gratitude. It’s amazing to know that the students are always listening, watching, and learning. On my final day at the school, my school co-workers organized a farewell lunch for me. There were speeches as we enjoyed one of my favorite Swazi street foods, chicken dust. The staff presented a t-shirt they had made for me. On the front is a black and white photo of me eating a piece of meat. I was told that the reasoning for this was because I have introduced myself around the community on numerous occasions saying, “Nginu Sibusiso. Ngiyatsandza inyama”, which means “I am Sibusiso. I like meat”. On the back of the shirt, it has my Swazi name (Sibusiso) at the top, “eSwatini KuseKaya” meaning “eSwatini is home” in the middle, and my blog signature at the bottom. I am thankful to have joined such an amazing core of teachers. The above picture was taken by one of our students after the farewell luncheon and features many of the teachers from our local high school. Some months back, a fellow PCV began planning a commemoration event called Walk The Nation. In 2008, a PCV in eSwatini organized a 200 kilometre walk to bring attention to the high HIV incidence in the country. The commemoration event was designed to look at how far the fight has come, and how much more needs to be done. Several PCVs participated in the commemoration of Walk The Nation by having events in their respective communities. Some volunteers showed documentaries while other marched and had discussions about where we go from here. Some volunteers were given paint to complete mural projects. Luckily, my community was given paint and associated supplies. At my local high school, I spoke with students about HIV incidence and how far eSwatini has come. When I introduced the mural possibility, several students were excited and began working on concepts and drawings. Last week, our students (and a few recent alumni) completed the mural project. My hope is that as the student body sees this image, they will remember that education can lead them to any and all places. Last Monday, I arrived at school like I always do. I noticed the head teacher talking to another teacher. It looked as though they were discussing important matters, so I acknowledged them and proceeded to lock up my bike. The head teacher approached me and told me that one of our students was killed in a car accident the previous Friday. The student was also a fellow teacher’s son. In Swazi culture, it’s proper for the bereaved family to receive delegations from varied aspects of the deceased and their lives as people offer condolences. On Monday afternoon, we travelled, as a delegation of teachers, to the bereaved family’s homestead to offer condolences. This is done in one of the homes on the homestead that has been cleared out to receive guests. Songs were sung. Prayers were uttered. Tears were cried. In rural eSwatini, the memorial services start either Friday or Saturday night with a night vigil. This past Saturday, several students and teachers travelled to the bereaved family’s homestead for the night vigil. There’s a very large tent set up for this occasion. Starting around 9 pm, the night vigil is like an extended church service/praise and worship session. There’s singing and dancing followed by sermon-like messages from people in attendance. It’s a joyous celebration. Around 3 am, there was a tea break. Hot tea and refreshments were served. After the break, there were more songs and prayers before speakers from various delegations offer condolences. The obituary was also read during this time. Singing and praying continued. Around day break, services wrap up in the tent. Shortly after first light, there is a processional (behind the pallbearers) from the tent to family’s graveyard. This is usually on the homestead or relatively close. At the grave site, there are prayers before the body is lowered into the ground. The family then proceeds to fill the hole with the recently excavated dirt. After the hole is completely filled, there are prayers of thanks and benediction before people disperse. The above picture is of the processional to the grave site at first light. In late 2017, I was at home browsing Reddit as I had done many evenings prior. I’m not sure what I had searched or what sequence of clicking had landed me on this page. At first glance, I thought it was one of the internet’s jokes. One thread read “…Wikipedia offline…”. My interest piqued, I decided to take a look. The Wikimedia Foundation decided years ago that they would make the entire Wikipedia database available to the public. In other words, someone could now download the entirety of Wikipedia’s content and have access to it without internet connectivity. Various programmers and organizations developed offline browsers that could be used with the database files. One such organization is Kiwix. The Kiwix platform uses .zim files and features many products from the Wikimedia Foundation including WikiVoyage, Wikitionary, and Wikiversity. With knowledge of this possibility, I immediately thought about conversations at the school during the past year. Our students were trying to keep up in the information age without reliable access to information. We had a computer lab, but no internet connectivity. I spoke to my head teacher and counterpart about the possibility of equipping the computer lab with offline Wikipedia. They agreed, but wanted to see something in action. I decided that I would put together a proof of concept presentation. I downloaded Kiwix for Windows and the Simple English .zim file. When I showed my colleagues how the program worked, they began to share my excitement. My head teacher requested that we move forward with the larger Wikipedia files. I spent half of November and all of December downloading Wikipedia for Schools, Wikipedia (in English) without pictures or videos, and other wikis. Now, the 2018 academic year is under way. The computers in our lab are now equipped with the offline Wikipedia resources, and I am teaching students and colleagues how to use the software. Many of my colleagues and students are very excited. The software is being used by teachers to brush up on some subjects. Students are using the software to better understand the topics covered in class and to prepare for their external exams in term three. Throughout this term, students have stayed after school to study and print Wikipedia articles to use at home. Last week, I was invited to another volunteer’s school to present on the Wikipedia resources to their students and staff. Apparently, their students really enjoyed the presentation. On the day following the presentation, they convinced their teacher to take them to the computer lab. Once there, they debated advantages and disadvantages of social media use. One of the teachers at their school also took her students to the computer lab to better understand iodine and its properties. I’m beyond excited to see this project taking shape. In my vision for Swaziland, all schools would be using Wikipedia offline if they don’t have internet access. I’m also excited about chipping away at the digital divide. The picture above (taken by one of my students) is of me teaching my Form 4 students about the various wikis. Swaziland has opened my eyes to many new things. I have a newfound love of ice water and mangoes. Learning siSwati has introduced a culture of depth and tradition. I have also taken a special interest in the small critters I see in the rural community. Apparently, this is a thing for PCVs in many countries. A PCV in Mozambique organizes and curates an Instagram account (@woahinsecto) featuring insects from all over the world. Growing up in an urban environment, I found insects to be a nuisance. When I did journey to more rural places on family vacations, the insects were huge and had stingers that left itchy bumps. The only insect that had redeeming qualities was the firefly because it lit up the summer sky. I’ve seen creatures here that are truly stunning. Some of the tiny critters are extremely hairy. Other critters are incredibly colourful. A couple of weeks ago, I was at school heading to class when I saw the critter pictured above. I thought it might jump when I got close, but it didn’t. It did start walking away. Luckily, I was able to get close enough to snap this picture. P.S. – According to @woahinsecto, the creature above is the Pygromorphidae and their colors are a warning to predators that they are chemically protected! Warning: This post does have some spoilers regarding Black Panther. I’m writing this on Wednesday 21 February. 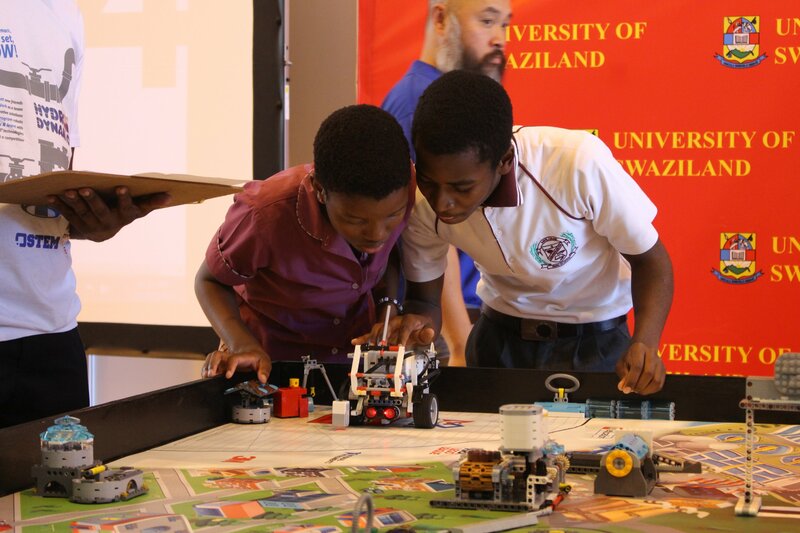 Today, students from 14 different communities across Swaziland came together to journey to Wakanda. Some students and chaperones traveled for hours to Swaziland’s only movie theatre. As I journey back to school with my students, I’m tired and happy. My heart is full. For many students, this was their first trip to the cinema. They were excited. I was excited. Everyone was excited. The students were able to meet and fellowship with other students from around the kingdom. And as an added bonus, they got treated to the cinematic experience that is Black Panther. After the movie, several students gave a Wakandan salute and two thumbs up. I was able to speak with some of my students after the film about their thoughts and reactions. One student said that he enjoyed the film overall, but that he was really appreciative of how the ancestors were intertwined into the story. To see T‘Challa consulting his late father in the ancestral plane was powerful. Another student was enthralled with the relationship between Africans and Black Americans as he sought to understand why Killmonger wanted to destroy Wakanda. I must say that I have a newfound appreciation for the teachers and other responsible adults who chaperone field trips regularly. If you haven’t experienced this film yet, I’d highly recommend it. It’s a cinematic delight. The above picture was taken just before the students went into the theatre to see Black Panther. On a related note, I never knew how difficult it was to get 70+ school children to stay still long enough to take a picture. P.S. – Sihambile eWakanda means “We went to Wakanda”. P.P.S – Here’s a picture of me, my counterpart, and our top students (per last year’s results). We are currently in the third and final term of the academic year in Swaziland. The biggest focus of term three is exams. Earlier this month, Form 3 (equivalent to grade 10) and Form 5 (equivalent to grade 12) students started writing their external exams. Think standardized testing with the highest of stakes. All other high school students will begin writing internal exams in November as schools prepare to close in early December. While internal exams are designed by a school’s teachers and vary from school to school, external exams are designed and written by the Examinations Council of Swaziland. Schools typically bring in external moderators, called invigilators, for the external exams while a school’s teachers will serve as invigilators for that school’s internal exams. Upon successful completion of the Form 3 exams, students earn a Junior Certificate. For this reason, the Form 3 exams are sometimes referred to as the JC exams. With a Junior Certificate, students can apply to various vocational schools around Swaziland. Upon successful completion of the Form 5 exams, students earn an ‘O’ level certificate. This is equivalent to a high school diploma, and is needed to attend university. 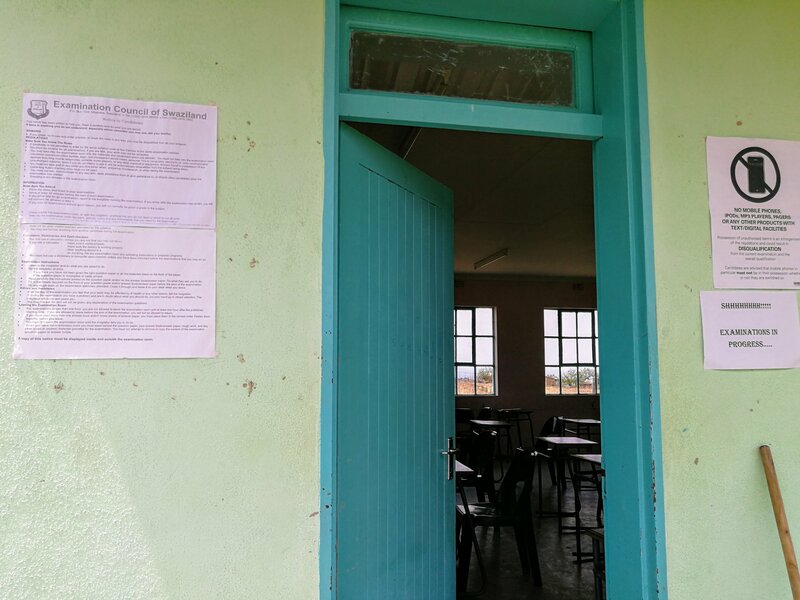 In the picture above, the required notices are posted outside of one of the classrooms being used for external exams. Students are not allowed to bring extra materials into the exam room, and typically leave their bags lined up outside of the room. There are numerous organizations that offer aid to people around Swaziland. Some of these organizations are based here in the kingdom. Some organizations offer financial support while others inkind support and supplies. One such organization is The Mother Bear Project. Based in Minnesota, the organization sends hand knit (or crocheted) bears to young children in developing nations affected by HIV. Volunteer knitters are asked to either hand knit or crochet a bear from a given pattern. 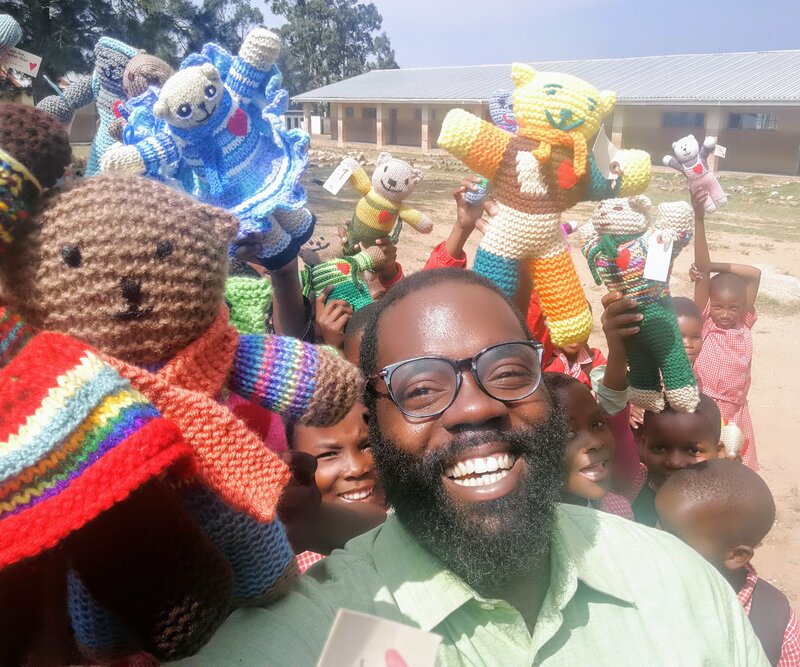 The knitted bears are a labor of love project seeks to comfort affected children. Last week, I completed a distribution of Mother Bears at one of the primary schools in my community. The students were very excited with big smiles as they received the bears. The above picture is a selfie of me with some of the children after receiving the bears.